O'Gara and Wilson, Booksellers: Books have destroyed many writers, and possibly me too! Books have destroyed many writers, and possibly me too! Well, that's not the terrifying part. That's just the cool owl logo next to the author name on the cover of this 1903 tome: Books Fatal To Their Authors. 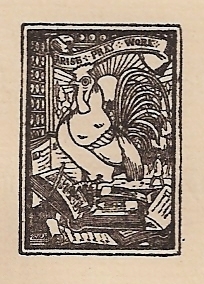 It also has a cool rooster stamp on the front free endpaper! To record the woes of authors and to discourse de libris fatalibus seems deliberately to court the displeasure of that fickle mistress who presides over the destinies of writers and their works. Fortune awaits the aspiring scribe with many wiles, and oft treats him sorely. If she enrich any, it is but to make them subject of her sport. If she raise others, it is but to pleasure herself at their ruins. What she adorned but yesterday is today her pastime, and if we now permit her to adorn and crown us, we must tomorrow suffer her to crush and tear us to pieces. To-day her sovereign power is limited: she can but let loose a host of angry critics upon us; she can but scoff at us, take away our literary reputation, and turn away the eyes of a public as fickle as herself from our pages. Surely that were hard enough! Can Fortune pluck a more galling dart from her quiver, and dip the point in more envenomed bitterness? Yes, those whose hard lot is here recorded have suffered more terrible wounds than these. They have lost liberty, and even life, on account of their works. The cherished offspring of their brains have, like unnatural children, turned against their parents, causing them to be put to death. Fools many of them -- nay, it is surprising how many of this illustrious family have peopled the world, and they can boast of many authors' names which figure on their genealogical tree -- men who might have lived happy, contented and useful lives were it not for this insane cacoethes scribendi. And hereby they show their folly. If only they had been content to write plain and ordinary commonplaces which every one believed, and which caused every honest fellow who had a grain of sense in his head to exclaim, "How true that is!" all would have been well. But they must needs write something original, something different from other men's thoughts; and immediately the censors and the critics began to spy out heresy, or laxity of morals, and the fools were dealt with according to their folly. Now that, dear readers, is motivational. In case it's not clear from the admittedly florid introduction, this is a collection of short biographies of writers who have been jailed or slain for their work. Chapter titles include Fanatics & Free-Thinkers; Astrology, Alchemy & Magic; Satire; Drama & Romance; Booksellers & Publishers; and many more. The misfortunes of everyone from Tyndale to John Dee to Daniel Defoe are chronicled here, and all for $20.00! I have to admit, part of me can't wait to be killed for my writing. How romantic is that? These scans are from Barrio: Photographs from Chicago's Pilsen and Little Village, a book of photographs (with some storytelling) by Paul D'amato. 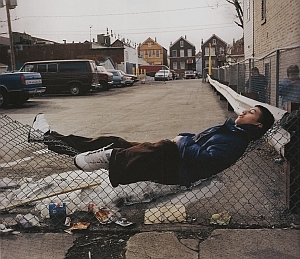 D'amato spent 14 years -- 1988-2002 -- trying to integrate himself into and photograph the Latino culture in these areas. He caught girls and boys like those above; people at work, people at play, even gang members spray-painting walls. Although he acknowledges that he can't help but be an outsider, D'amato writes that he hopes he caught some of the inside view. The resultant book is worth every penny of its $20.00. Doug acquired the books of a mineral collector, and then Doug -- being the enterprising gentleman that he is -- acquired the minerals too. 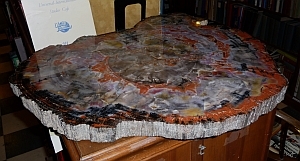 There are a number of lovely rocks scattered about the store, but this is by far the queenliest gem, and a steal at $1500.00. (Really, it is a steal. Most such pieces would be far more expensive.) Come in and admire it soon! 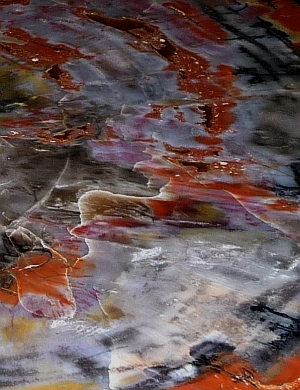 It is a rare piece and may soon be acquired by a gem-lover. Also, if you buy it before the gem-lover does, then this is a good day to do it because today is not so hot. You could probably carry it all the way down the block without dying of heatstroke ... unlike other recent days I could name. And now this will be my third recent entry that I end with complaints of the heat. But really it's because I'm concerned about you! Drink lots of water, dear reader, and we'll talk again soon.